A software engineer has created an app that uses the 3D Touch system on the new iPhone 6s to compare the weight of different objects. A few months back at IFA 2015, Huawei seemed to troll Apple on stage by using the pressure-sensitive display on the Huawei Mate S to weigh an orange. Later on, we found that Huawei's demonstration was more than a marketing shot aimed at Apple - the Huawei Mate S was the first smartphone to promise a pressure-sensitive display, after all - and the digital scale app is a feature that you can actually use on the Huawei Mate S.
In an attempt to unify the experience across all iOS devices, Apple had to limit the functionality of the 3D Touch system. In essence, Apple only allows developers to use 3D Touch as a shortcut to certain app functions, but the company does not approve apps that fully rely on the pressure-sensitive display to function since these apps would be useless on older hardware. Although Apple limits the way that devs can use the 3D Touch system, this hasn't stopped a gifted developer from creating an app that can actually weigh down objects. 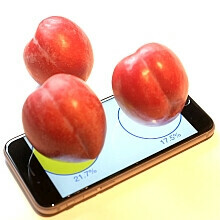 Called the Plum-O-Meter, the app can be used to compare the weight of an object to the maximum pressure level that the iPhone 6s display can detect. Furthermore, the app can also compare the weight of multiple objects, which is a nice trick on its own. Unfortunately, the developer says that your iPhone is not going to replace your precision electronic scale anytime soon, since the values that the system register vary depending on how many objects are placed on the display. Furthermore, the app can only be used to weight-compare objects that are heavier than the minimum force required to register a tap but lighter than the maximum pressure level of the 3D Touch system. If these weren't enough limitations, the Plum-O-Meter is only available on jailbroken iPhones at the moment, with little hope for the app to ever make it to the official App Store. The developer has published the source code behind the Plum-O-Meter app on GitHub and has also shared some insight on how to make use of the 3D Touch API to solve various use cases. If you're an iOS developer, the source link below is a must-read. What do you guys think of the Plum-O-Meter? IMA use this to scale the amount of weed. Gotta know the measurements of the good-good, knowhatimsayin? They copying huawei mate s with this .. I doubt this is gonna be accurate (or even close). 3D Touch wasn't designed for this. On the other news about 3D Touch, more of my games have integrated 3D Touch inside the fame (not just contextual menu when you press on the app. Jungle heat now allows filling the cue with troops using force touch to instantly fill it so you don't have to wait for the to load. And deploying troops diluting battle: force touch deploys 50 at a time instead of one by one the conventional way (or use a toggle option). Funny thing is, I had this idea in my head after playing with force touch on the first day. Shoulda got a patent lol. For what? That again Apple stealing something and claim to invent it? Hope Huawei take what is their in court. So you think that a company that used force touch hardware on their devices first should sue those that used it after? Alik, actually my post was a joke directed at you. I expect the other two to respond like they did, but I thought you'd get the joke. You shouldn't, and I'm not either. I love the feature, and look for more OEM's to implement it sooner than later. Unfortunately, it'll lead to me courtroom battles. I bet you this scale stuff will be added as an OS update later on. That is accurate enough and versatile to Apples liking. I hope no one is thinking of making a scale app for ppl. I'm sure Americans will do it and use it. Can it weigh my truck?? Can i compare my balls weight ? Sure can. Do it before and after your boyfriend plays with them. LMAOOOOO LMAOOOOO LMAOOOOO! F**k it, one more LMAOOOOO ! It doesn't look like its actually measurement weight. It looks like it measuring how much surface its taking up. If you look at the video, he got 3 different reading from the largest of the 3 plums, simply because he placed it differently on the screen. If you take box that has a 2 lb oject inside, the box will weight the same, no matter where the object is inside the box, because the box has the same weight on ist regardless of what is inside. I am betting with this app, I can place to different small objects that weight exactly the same, but will get a different reading due to the size difference. It is a good idea though, but its to easy to fake because you cat redistribute the weight of the plum by putting it on a different side because its not weighting it, it taking into consideration how much screen surface is being used. Its saying a fruit of this size took up 20% of the surface, while flipping it around the same fruit took 17%. Look at the part where he puts the biggest plum on both sides and you will see when it rolled over the number dropped from 20% down to 17%. No matter which side the fruit is on the weight should eb the same or only off a small amount. A person 250lbs should still weight 250lbs as long as his weight is distributed evenly on the scale. So if you weighted 250 on a standing scale, then if you lie on a scale it should still say 250 has long as your weight is distributed evenly.